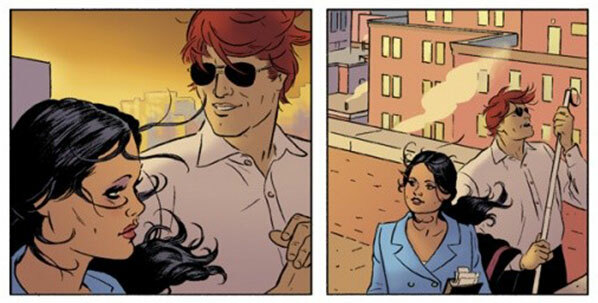 Daredevil Relaunch Rumors: Is that Michele Gonzales? First off, I’ll readily admit that I didn’t figure this one out myself, but I almost feel like I should have because it seems to so obvious in retrospect. Rather, the credit for suggesting that the pretty hispanic lady we’ve seen in Paolo Rivera’s preview art could be Michele Gonzales (of Spider-Man fame) go to the poster behind this Scans Daily post as well as a number of people in this CBR thread. So, what do you think? Open and shut case or do you have any other guesses as to who it might be Waid is talking about here? I confess I though of Mary Jane, maybe because she’s a redhead too… And wouldn’t it be a nice irony for the former Mrs. Parker -that never was, thanks to Quesada and Mephisto- to date a devil? Bommer, I hoped it was the Black Cat. just because a new writer comes on doesn’t mean he needs a new love interest. shame, wanted to see more of Dakota. @Marc: I suspect we’ll see more of Matt casually flirting than his throwing himself into a new relationship, and I’m not at all sure that Michele (if this is indeed her) is lined up to be Matt’s girlfriend. I’d also like to see more of Dakota and trust that we will, since Waid has said that she’ll be around.